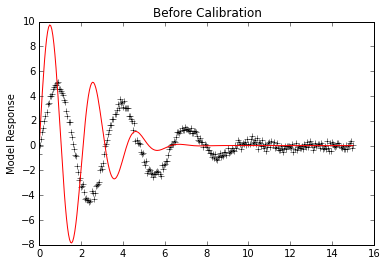 This example demonstrates the same calibration as Calibration Using LMFIT, but sets up the MATK model as an python script to demonstrate how to use an external simulator. Similar to the External Simulator (FEHM Groundwater Flow Simulator) example, the subprocess call (https://docs.python.org/2/library/subprocess.html) method is used to make system calls to run the model and MATK’s pest_io.tpl_write is used to create model input files with parameters in the correct locations. 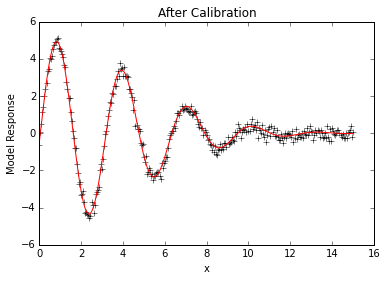 The pickle package (https://docs.python.org/2/library/pickle.html) is used for I/O of the model results between the external simulator (sine.tpl) and the MATK model. # terminal command to run your model. Template file (sine.tpl) used by pest_io.tpl_write (refer to run_extern function above). Note the header ptf % and parameter locations indicated by % in the file.